David Bayles’ Art and Fear (a great book a great teacher once recommended) has a line that reads: “Fears about yourself prevent you from doing your best work, while fears about your reception by others prevent you from doing your own work.” But how does an artist – who has to sell tickets to pay the bills – connect with her audience and still hone her personal aesthetic? What defines one’s “own work”? Choreographer Angella Foster struggled with these questions as a young artist. “I was trying to make work based on what other people told me being a modern dance artist was,” she said in a recent Skype interview from her family’s home in Kentucky. As others hailed the virtues of abstract movement, she realized her heart was in storytelling. A native Kentuckian, Foster called the oral story tradition part of her “artistic DNA”. For her, stories provide inspiration and a way to meet her audience at a place of understanding. “I want people to feel invited into the work as opposed to feeling like it’s some puzzle they’re supposed to figure out,” Foster said. 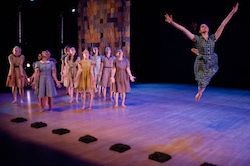 alight dance theater in ‘Women’s Work’. Photo by Enoch Chan. Six years ago, Foster founded her company, alight dance theater, to promote creative collaboration in the city of Greenbelt, Maryland, just outside of Washington D.C. Foster directs the recreational dance program for Greenbelt and receives rehearsal space. 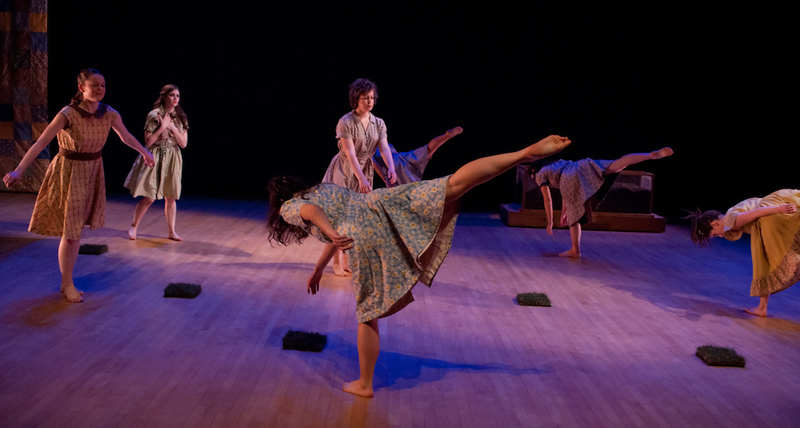 The company tours regionally but performs primarily at Dance Place in D.C., where it will restage two new works October 29-30: Foster’s “Women’s Work” and “Blue Mountain Express”, choreographed by alight company member Matina Phillips and collaborator Eleni Grove. As the mother of a three-year-old daughter, Foster said she’s amazed and inspired by that kind of resourcefulness. In response, she connects to the strong women who came before her by creating her own artistic worlds on stage. Using her degree in creative writing, Foster begins each process by journaling and reflecting on a story that resonates with her. In addition to choreographing and writing the text (which she incorporates directly or indirectly into her works), Foster also designs and builds the costumes. She likens the process to quilt-making – with her dancers contributing pieces to the whole – and calls the end products her “mini novels”. With its narrative structure centralized on an all-female cast, “Women’s Work” illuminates Foster’s belief that women’s bodies are powerful and “not at all incomplete” tools for storytelling. For her 2013 work “Stargazing”, the choreographer spoke with NASA astrophysicist Amber Straughn before delving into questions of the cosmos. Although Foster said there was nothing specifically “female” about their discussions, she loved the idea of exploring the intersection of science and art through female dancers. As part of alight’s mission, Foster continues to nurture women’s choreographic voices through a process of mentorship. 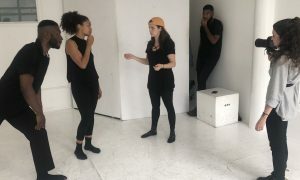 When Phillips, who has been a company member for some years, expressed interest in choreographing, Foster felt compelled to offer resources and a professional performance venue. Set to bluegrass music, “Blue Mountain Express” follows the story of four women who meet on a train. This will be the first time alight has presented Phillip’s work. In part because of her collaborative spirit and commitment to mentoring younger artists, Foster chose not to name her company after herself. She liked the word “alight” (deliberately kept in lowercase letters) because it brought to mind something small and delightfully surprising, like a butterfly. As two words, “a light” is a bright spot in a community, an organization devoted to “serving people where they are”. For ticket’s to alight dance theater’s repertory performance, presented at Dance Place in Washington, D.C., October 29-30, click here. 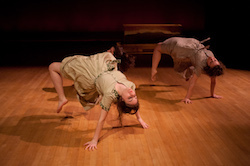 For more information on alight dance theater, visit www.alightdancetheater.org. 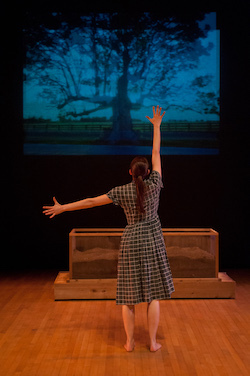 Photo (top): alight dance theater in ‘Women’s Work’. Photo by Enoch Chan.